Welcome to my birth province, Zambales! It’s been a while since the last time I've visited my father’s homeland and it excites me to see the countryside that had been a total stranger to me since the day we transferred to the Metro. 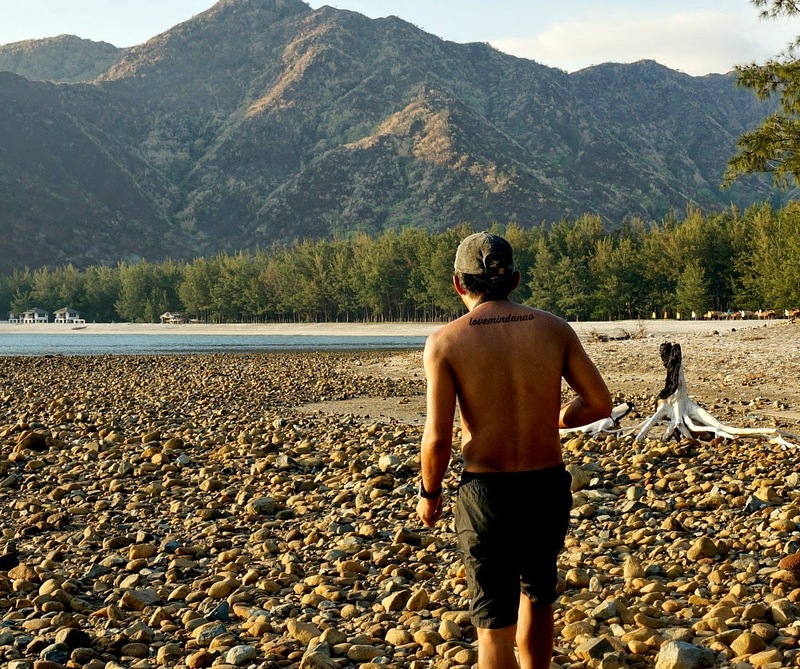 Yes, technically I rooted from Zambales, Philippines and it would be a shame for me not to feature some of the best places you can find in my place of origin. My vivid memory of this province shows the simple life we had. As children of farms, we used to play on a vast mango plantation and pick some fruits from the cashew trees and eat them while running on rice paddies, dodging all the dogs guarding the properties we trespassed on. The province is more than just shrimps and mangoes as this sleepy province have been endowed with wild sceneries worth visiting even before it was hit by a great disaster. In 1991, Mt. Pinatubo erupted tagging this devastation as one of the greatest and fatal volcanic eruptions in history, resulting to loss of thousands of lives and destruction of properties and livelihood worth billions of pesos. But who would have thought that this natural phenomenon would give a positive feedback by altering beautifully some landscapes in the area. Aside from the majestic crater lake of Mt. Pinatubo, the volcanic sands that showered heavily into the ocean were washed towards the rocky shore of the province, giving birth to some of the most beautiful white sand coves in the region. 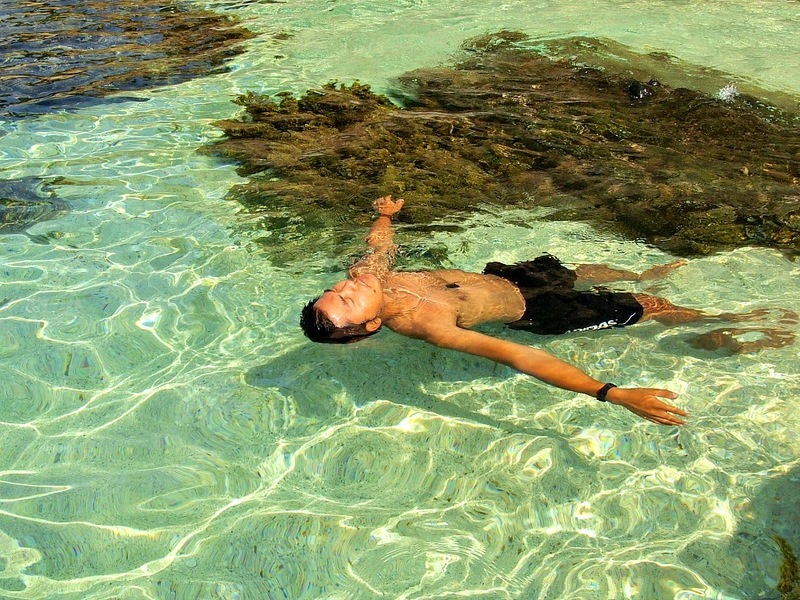 Anawangin is one of the coves that emerged after it was discovered by mountaineers in early 2000. But as the cove became popular, tourists and wanderers and even locals have abused the white sand beach of Anawangin. 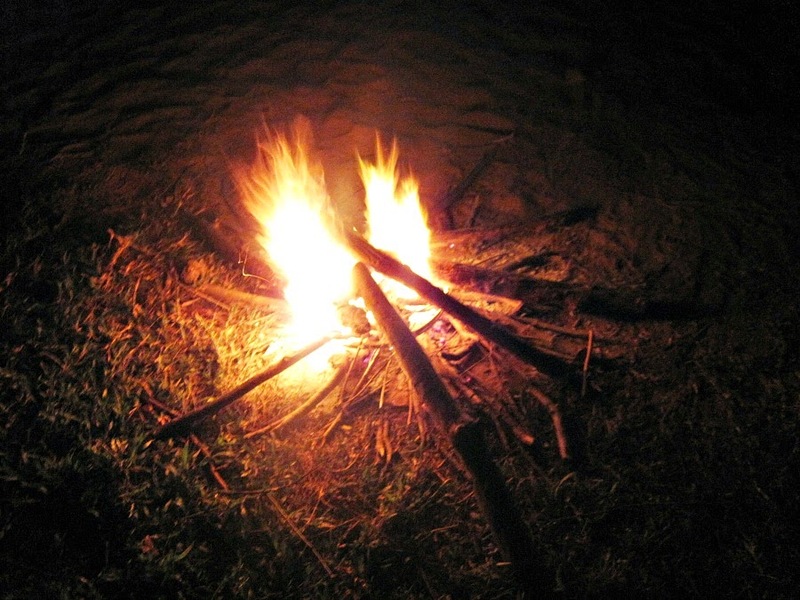 Many were enticed to camp into the white sand shore and since there is no electricity, most campers have placed their bonfire almost in every inch of the cove. Much they didn’t know, the ashes and charcoals have mixed with the white sand, losing its pristine look and now beyond recognition compared to its original status. Nature has given this beauty so generously but WE, humans have destroyed it in just a matter of years. Our group visited Anawangin once and even have helped in promoting this place as a new destination for wanderers. But the local government of San Antonio wasn’t prepared during that time as they have done less conservation management in the site. Anawangin has been a good source of livelihood for the people of Pundaquit , generating income that sustained families and made the economy of the town lively. 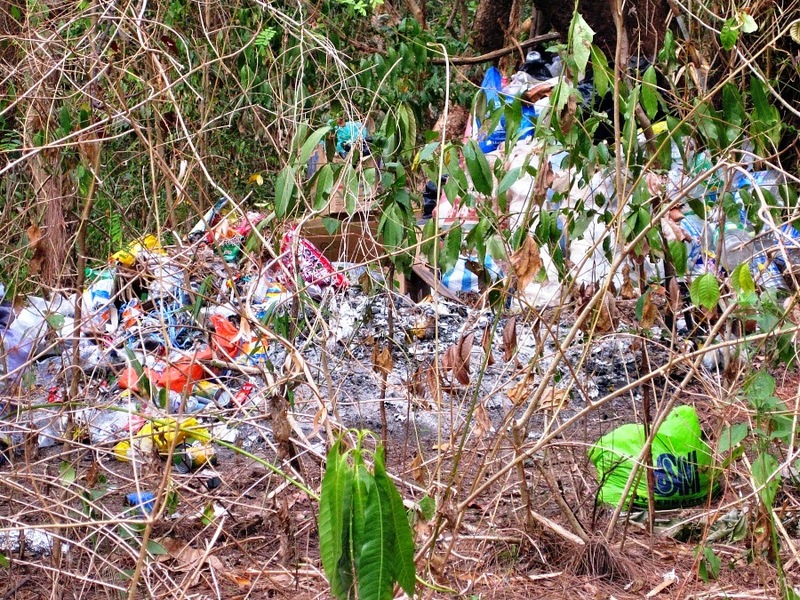 Garbage now pile up in Anawangin, A big NO NO to me! But somehow the locals and some capitalists have just dwelled on the idea of earning money and they have forgotten to put restriction on the carrying capacity of the place. They have allowed visitors to camp more than the cove could take. The environmental impact was unimaginable and the scenario was comparable to a beautiful girl that was raped to death without mercy. Now that Anawangin is almost far beyond recognition, the locals have felt the sudden decline in the number of guests visiting Anawangin. Even I won't recommend this place to my friends, shame of the unbearable stench of rotting garbages dumped by the backside of the beach and being feasted by thousands of flies flying around. Ewwww! Death came upon on the cove of Anawangin and it is regretful to think that this place lost its charm. 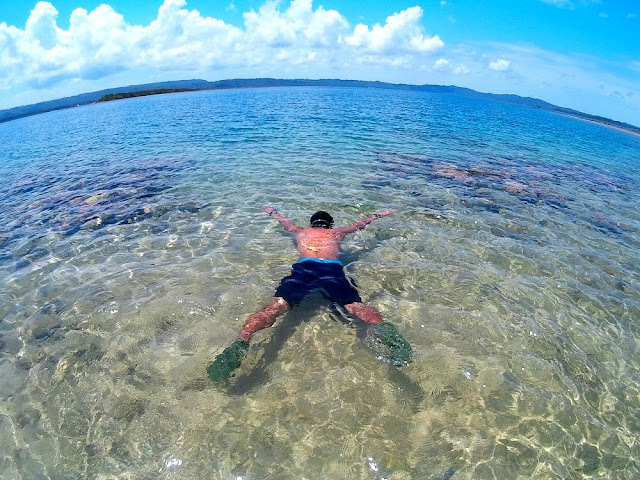 But as we roam across the sea, we discovered that there is a nearby cove known as Talisayen, a beach that is less visited by tourists in San Antonio. (For locals of Zambales you pronounce it with soft "e" Ta-le-sa-yen but for Tagalogs, you pronounce it as Talisayin). 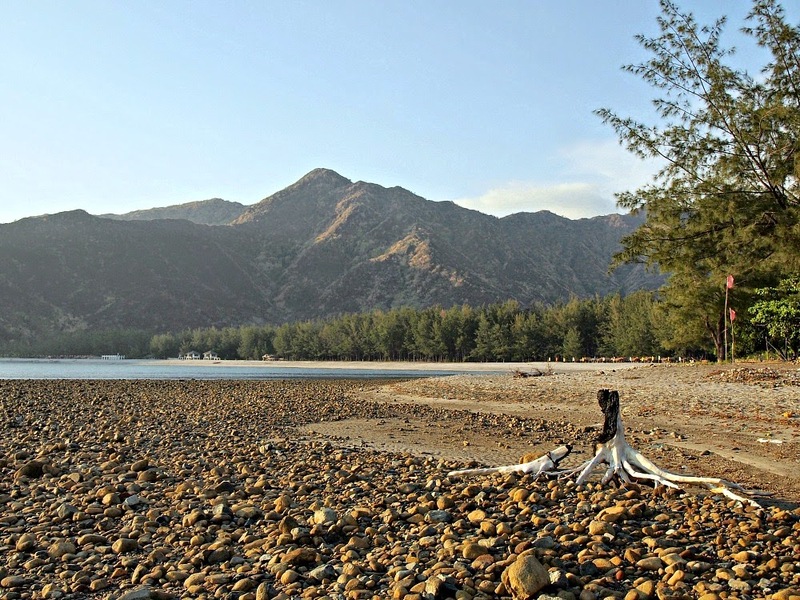 The whole cove is almost of the same size of that of Anawangin and the whole stretch is planted with Agoho or Casuarina trees (Agoho is not a pine tree by the way). The sand is clean and whiter than Anawangin and with no trace of trash littered on the seemed innocent beach. 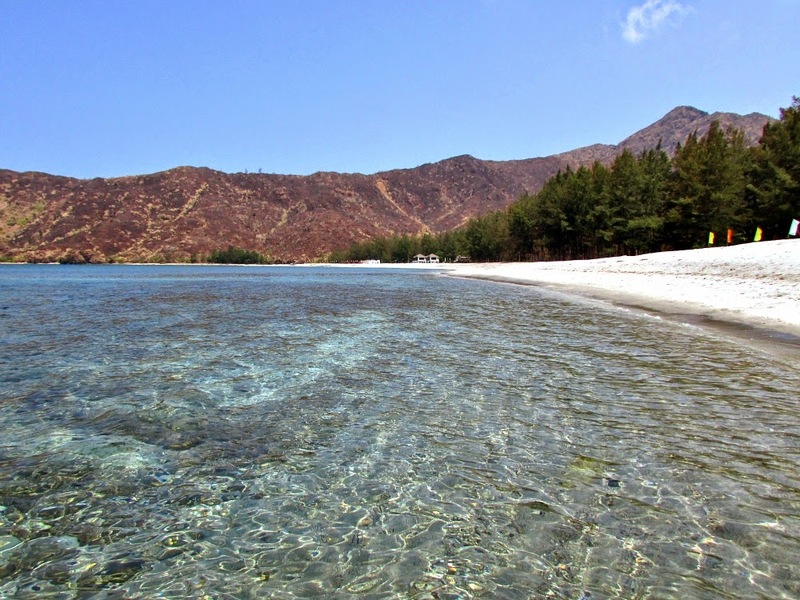 This cove is privately owned by some locals from San Antonio and have placed proper waste management in their respected areas to maintain the cleanliness of the beach. At Nene Tayag’s property, guests are required to pay Php 100 /head. Cottages are free except for the nipa hut that can be rented for Php 500-800 a night. Pitching your tent in the area is also allowed. To avoid too much bonfire set by guests, the operator put up a generator to put light on the pitch dark night until 10pm. Clean comfort rooms/ shower rooms are also available but water is needed to be fetched from the "pozo" or from a water pump nearby. Nipa hut like this can be rented for Php 500 a night. Ate Nene has also a small store where you can buy some kitchen stuff like eggs, noodles,canned goods, softdrinks and if really needed, some liquors are sold at a higher price. Now that we gave birth to Talisayen, I just hope we have learned from the mistakes we made in Anawangin. Let’s refrain from setting up bonfires that have been proven to tarnish the beauty of the beach and I hope we are all responsible enough to dispose our garbage properly to maintain the pristine look and cleanliness of the beach for the benefit of the future users of this haven. How to Get to Talisayen? Alight at the Municipality Building of San Antonio Zambales and from there take a tricycle going to Pundaquit. Fare is Php 30.00 per head and travel time is less than 15 minutes. At Pundaquit beach there are boat rentals offering their service. Depending on the number of passengers, boat rental can vary from Php1200- 1800. 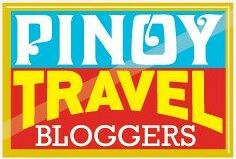 In our case we agreed on Php 1500 for 4 pax on a special island trip to Talisayen and to nearby islands the next day. Entrance fee in Talisayen is Php 100.00 (Nene Tayag's). 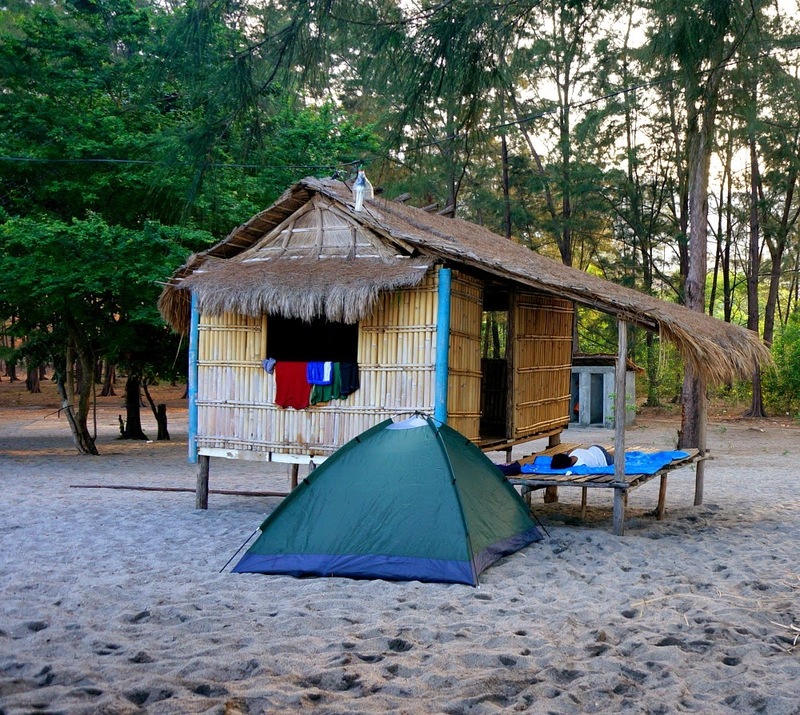 You can pitch your tent at the beach or if you have extra cash you can rent the nipa huts for Php 500.00. 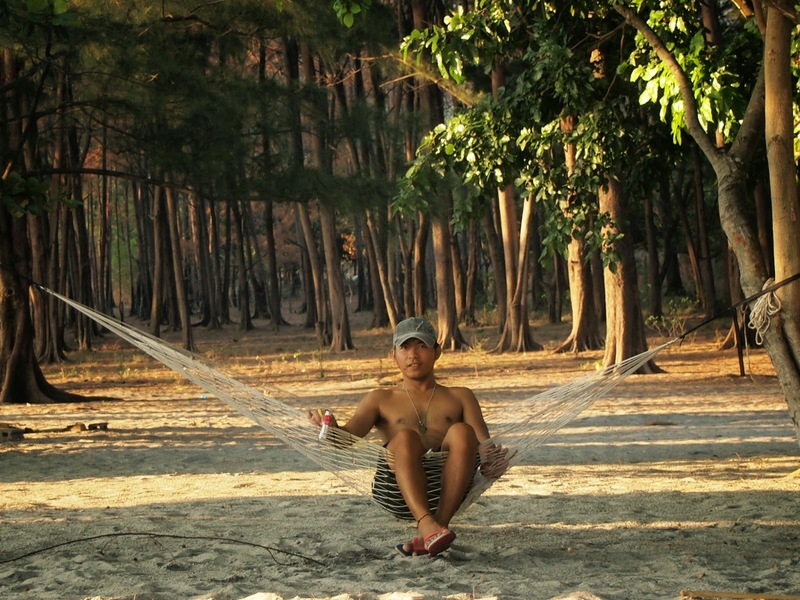 Just like in Anawangin, there are no electricity and cellphone signal in Talisayen. Bring your own cooking stove to cook your meal. Buy your necessities prior to coming to Talisayen as the prices of goods at the makeshift store soar high as the universe. Water and comfort room are available. Bring potable water with you. Don't forget to have FUN and LIKE and SHARE your photos and stories on our FB Page. If you still have extra time after your trip here, you may want to explore the nearby Municipality of Botolan. If you have questions, suggestions, ideas or observations about the place, feel free to leave your comment below. 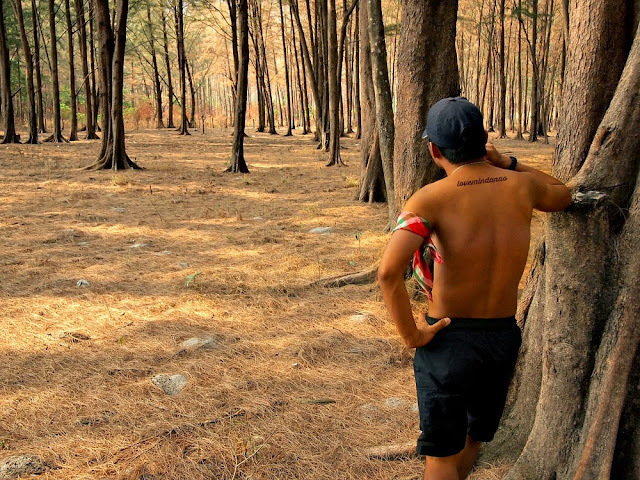 Be awe inside the Agoho 'pine' forest of Talisayen/Talisayin. Pitch your hammock for a relaxing stay in the cove.